On Sunday morning after a fitful night’s sleep I woke up to the day that I had been waiting for since I got my place back in October. 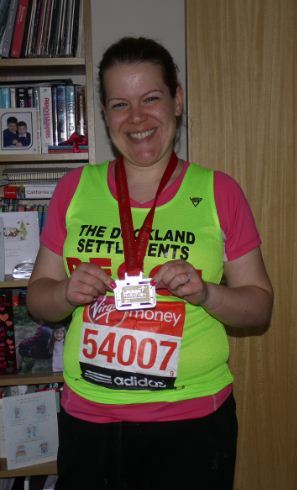 The day I would run the London Marathon. I hadn’t expected to sleep well, but I had at least had some sleep and I didn’t feel too tired when the alarm went off. As I got dressed in my gear and ate my porridge and banana a strange feeling swept over me. I still can’t quite put my finger on what it was – a mixture of anxiety, nerves, excitment and ever so slight sadness that by the end of the day it would all be over. 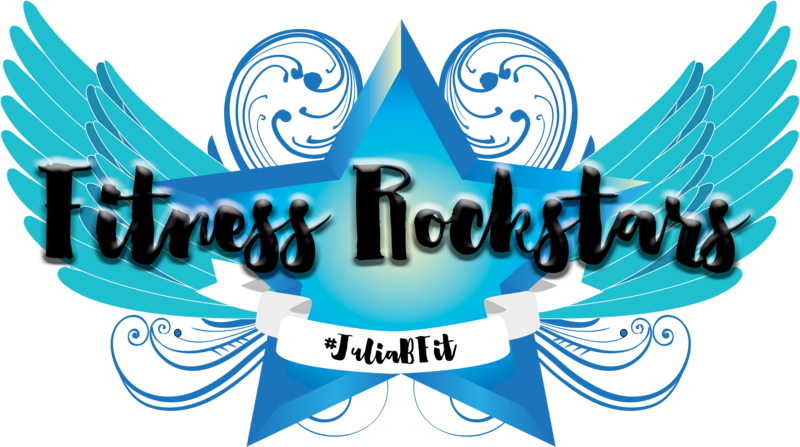 It was a heady mix of emotions, so when Mr J came to give me a hug and tell me that he was proud of me it pretty much sent me over the edge and I became a sobbing mess dressed in lycra for a few minutes. Having regained my composure I was ready to set off and meet my fellow Team Thinking Slimmer runners Darin and Dawn at Limehouse DLR station. I waved goodbye to Mr J and his Mum who had come to support me and headed out of the flat. Darin and Dawn were waiting for me at the station and we set off on the DLR to Greenwich. 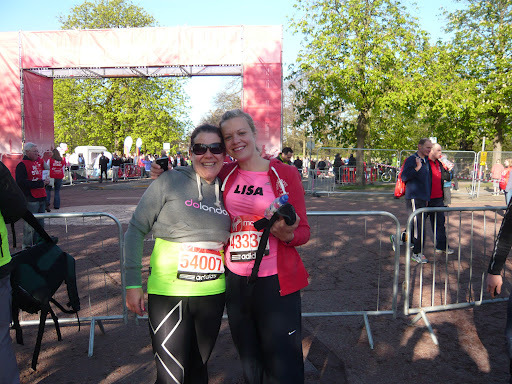 I was hoping that we might bump into my friend Lisa at some point before the start and as luck would have it she was standing right outside Greenwich DLR station when we arrived. We all walked up towards the Red Start together. Walking through Greenwich Park it all started to become very real. Hundreds, thousands of other people getting ready to take on the 26.2 miles. We said goodbye to Lisa and went off to try and locate the Nestle Pure Life tent as Dawn needed to meet them before the race. 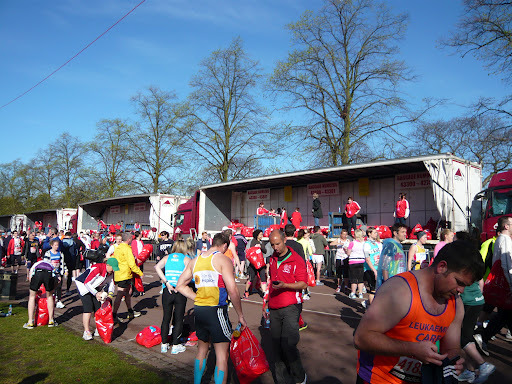 Having established our meeting point we went about our pre-race business – toilet stops, topping up the water levels, depositing our bags in the luggage trucks and getting ourselves ready for the start. 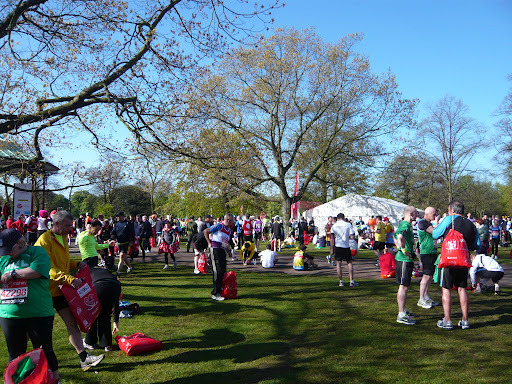 It was a beautiful morning in Greenwich Park – sunny and a bit cool – perfect runnng conditions. At 9am we watched the start of the women’s race on the big screens located in the park. 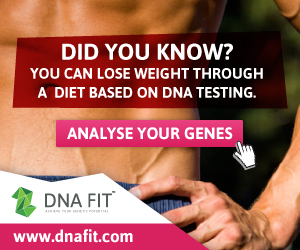 My stomach flipped – in 45 mins it would be our turn. After another toilet stop it was time to head for our starting pens. We were all in pen 9 – the last pen for everyone who had indicated a greater than 5 hour finish time. As the start time drew nearer the pen got busier and busier. There were people in front of us as far as my eyes could see. 9.45am finally came around and we moved…..nowhere. 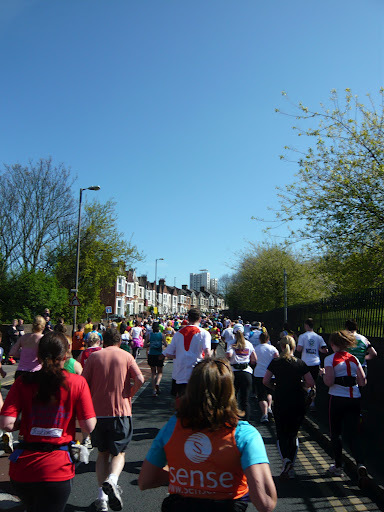 Then gradually and slowly we started to walk towards the start line. It must have taken about 20 mins for us to get to the gates of Greewich Park and turn the corner to see the start line. 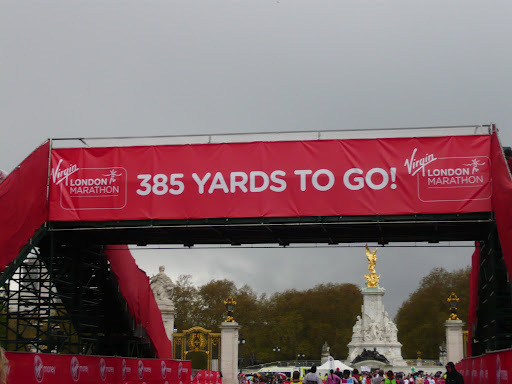 Finally we crossed it and at last starting running the London Marathon! We had a strategy for what we would do – run for 9 mins and walk for one at a pace of no more than 12 and a half minutes per mile. For the first mile this was relatively easy as there were a lot of people around but we soon had to concentrate on keeping our pace down and not running too fast. It was easy to get carried away – there were huge crowds lining the streets, cheering us on right from the start and the excitement to finally get started meant that the adrenaline was really flowing. The first few miles felt effortless and a lot of fun. Darin was working the crowd with style – high fiving all the kids along the street and lapping up the cheers. Dawn and I were keeping an eye on the pace and making sure he didn’t go rushing off ahead! 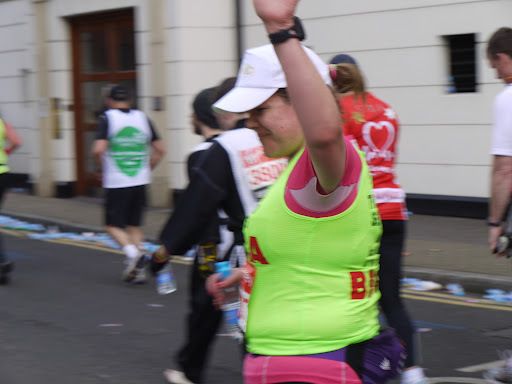 Within the first two miles I had scored two off my marathon bingo – I’d been passed by someone in a ridiculous costume (actually several rhinos) and a man who looked old enough to be my grandad. 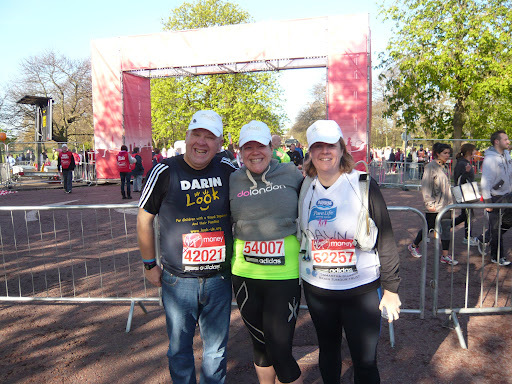 I was having a whale of a time, laughing and joking with Darin and Dawn and just soaking up the atmosphere. By mile 6 we were headed into Greenwich and towards the Cutty Sark. I was feeling pretty comfortable but was aware that Dawn had started to fall behind a bit. Darin and I have run together before and know that we are pretty evenly matched pace wise. Running with Dawn was a new experience. We had promised before the race that we would go ahead of her if she wanted us to and by the time we had passed the Cutty Sark she signalled to us that that time had come. Relucantly Darin and I headed off – we knew she’d be OK as she’s so strong and determined but we had hoped to stay together for longer. Miles 7-8 passed quickly and we noticed that we had picked up the pace a bit. At that point I began to feel it in my legs and said to Darin that I felt I needed to back off a bit. From the start I had been thinking that I needed the toilet. This often happens to me at the start of a long run – the phantom wee – usually caused by nerves. Every time before it had gone away, in all my training I have never had to stop for the toilet. This time it was real. I needed the toilet so soon after crossing the 10 mile marker we stopped to use the loos. Relieved, we set off again towards mile 11. 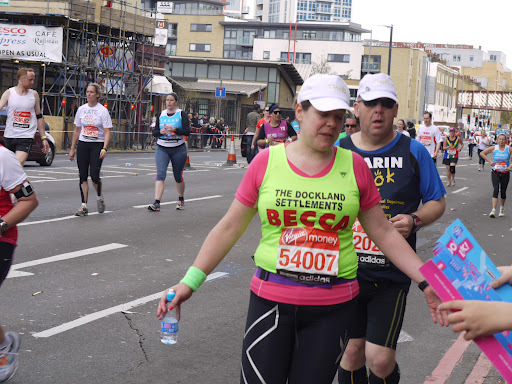 I felt like I was struggling a bit at this point so it was a massive surprise to suddenly hear “Go Becca, Go Darin” being shouted at us from by a voice that I recognised. I looked up and saw my friend Rachael standing by the side of the road, cheering us on. 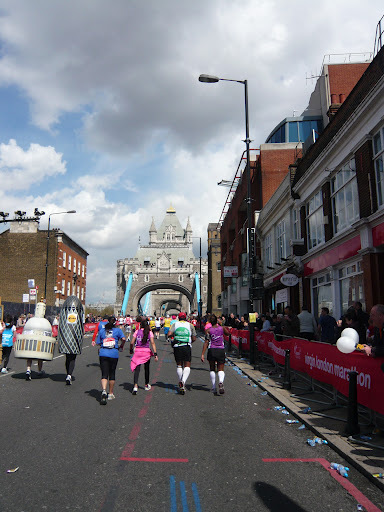 That gave me a real boost as we headed towards mile 12 and Tower Bridge. The noise that the crowds on the bridge were making was amazing, it made the hairs on the back of my neck stand up. My legs were starting to hurt and I’d been needed to take more walking breaks but I found a surge of energy from somewhere and we turned onto The Highway and towards the Mile 13 marker. I was now in home territory. I knew the route from here to mile 19 like the back of my hand. And I knew I had my family waiting at mile 14 – I was tired and achey but this thought gave me a lift. As we neared the 14 mile marker my calves were starting to hurt quite a lot and I asked Darin if we could take an extra walking break. He seemed quite relieved and admitted that his calves were hurting too so we walked for a while before turning off The Highway and onto Narrow St. We started running again as we turned the corner and headed towards the stretch of road where I knew my family would be waiting. It was fantastic to spot them all – they were waving like crazy and making a lot of noise. 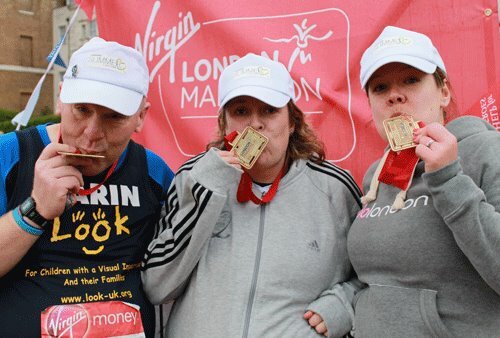 Literally a minute after we’d left my family I felt a tap on my back – it was @lozzatron from Twitter and the first member of the #vlmfamily that I’d spotted on the day. It was lovely to meet her, she looked like she was doing well and using the same kind of run/walk strategy as Darin and I. 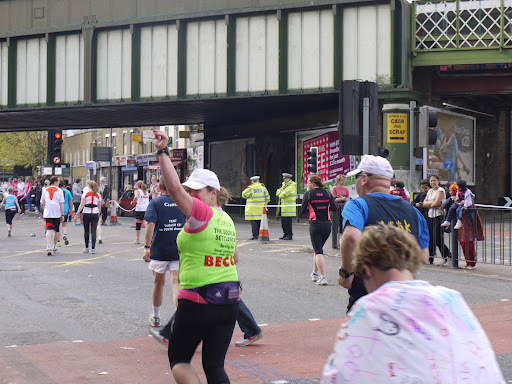 Then, just over the bridge I spotted my osteopath Glenn waiting for me – I ran to give him a hug and he ran with us for a while wishing us well and making sure we were OK. I felt on top of the world and like I could have kept running forever at that point but we were due a walking break and so we took one. We started running again as we turned the corner onto Westferry Road, but Darin pulled up quite suddenly with a pain in his calf. He said that it felt better when he walked so we walked for a while to see if it eased off. We tried running again but it was no good. Darin kept pulling up sharply and we knew something was wrong. We stopped to stretch for a bit and then carried on walking. I suggested that we should stop at the next St John’s Ambulance point and see if he could get a massage. The people of St John’s Ambulance were fantastic – massaged out Darin’s calves and advised him to take long walking strides and heel strike to help his calves. So we both did this for most of mile 16. At this point Darin turned to me and said “do you want to go ahead?” I had a decision to make but it took all of a second to make – we had started as a team and I intended to finish as a team. At that point the goal became to finish in one piece and all thoughts of mile timings went out of the window. As we turned the corner towards Mile 17 Darin wanted to try running again. We did for a short while but it was still no good – there was another St John’s Ambulance station and we decided to stop again to get him another massage. Once this was done we headed off towards Mudchute where I knew that @Dashinista was waiting. We nearly walked right past her as she was tracking me online as we went past but luckily I spotted her. After a hug and some words of encouragement we set off again towards Canary Wharf. Darin kept trying to run with no joy so we decided just to stick to the walking until we had got past 20 miles and see what happened then. So we power walked our way around Canary Wharf with me setting the pace and were soon arriving in Poplar and mile 20. At this point I started to get excited again as I knew my family would be waiting near mile 21. We were walking at a good pace and I was feeling good. Although this was new territory for us both I knew that if nothing else I could keep walking for another 6.2 miles for sure and I felt that as long as I did, Darin would as well. We were going to finish. 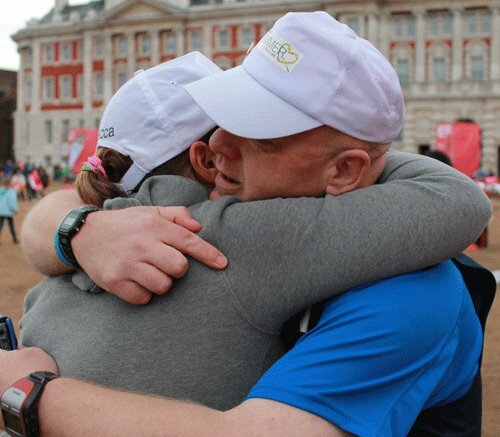 We stopped briefly for more hugs and words of encouragement before we set off again towards the finish line. Still over 5 miles away! As we turned the corner back onto The Highway and back towards the Embankment the sky was turning dark, the temperatute dropped and the wind picked up. The forecasted rain was clearly on it’s way. At this point the crowd came into their own. So many people shouting our names and wishing us luck – it was amazing, I can’t describe how much difference it made. Before long we were back at Tower Bridge and at this point the rain started falling. At first it wasn’t too heavy but before long it was pouring down. Luckily we were close to a Lucozade fuelling station who had just started handing out rain ponchos. We grabbed them gratefully and stopped under Blackfriar’s underpass to put them on. It’s a good thing we did as we emerged from the other side into torrential rain. 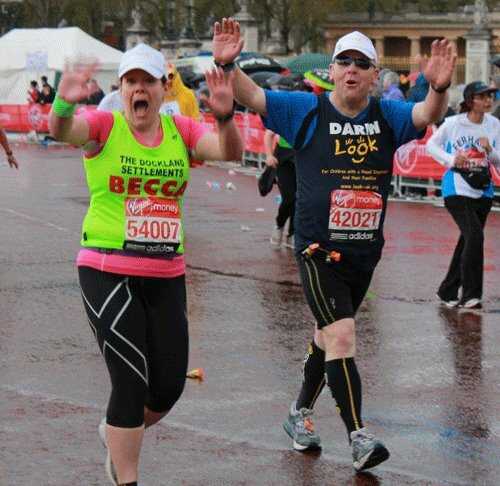 By this point we were at mile 24 and Big Ben was in sight. We kept trudging on knowing there really wasn’t far to go. The crowds were still there in the pouring rain. I was trying really hard to acknowledge each person who shouted my name with a smile and a thank you. One woman told me that I had given her the best smile she’d seen all day! 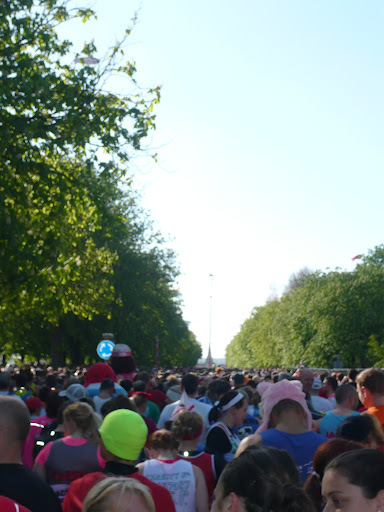 After a quick stop for hugs we turned the corner onto the Mall and ran the final few meters of the marathon. Crossing the finish line felt absolutely amazing. 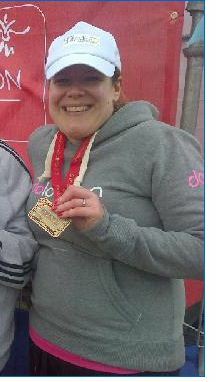 I had finished the London Marathon. The clock said 6hrs and 27 mins but I didn’t care – my goal was to finish with a smile on my face and I did that with style. We were given our medals and goody bags, picked up our kit bags and made our way back to Horseguards parade to the meeting area. I felt pretty spaced out at this point. I knew I needed to keep moving but I really wanted just to collapse. 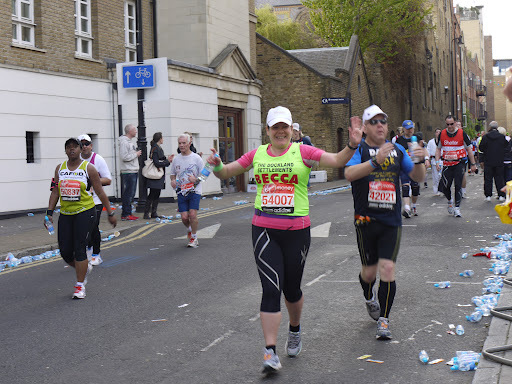 Once on Horseguards I spotted Mr J who had been waiting for me and we were re-united with Dawn who we later realised had crossed the finished line just minutes before us having kept her steady pace all the way around. 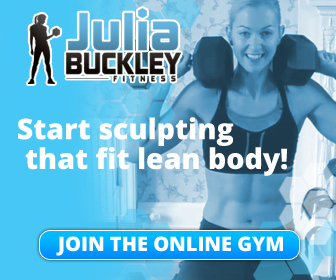 Team Thinking Slimmer had done it. I had done it. Only once I’d got home did it all really start to sink in. 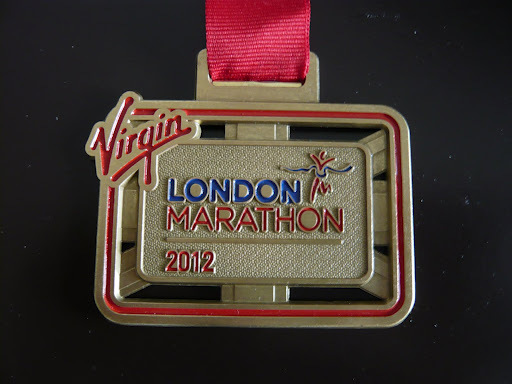 I had completed the London Marathon. Slower than I had ideally wanted but given what happened on the day I was just grateful to have got around in one piece. 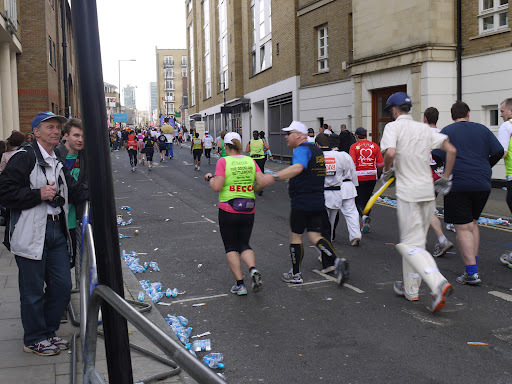 On the way home we started to hear reports that a young woman had collapsed and died in the final mile of the race. That just put everything into perspective. I had completed the race and I was alive and that really was all that mattered. 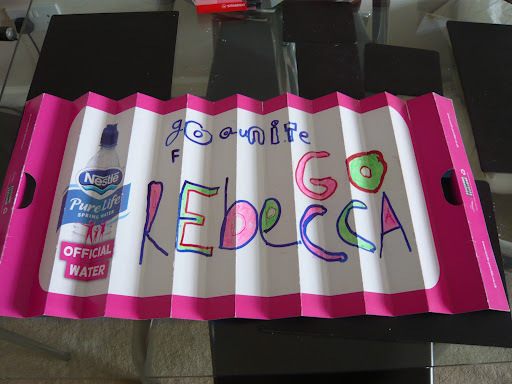 So I Rebecca Jones am now a marathoner. Would I do it again? In a heartbeat. Maybe not next year – I have a lot to work on in terms of strength and speed. But I will absolutely definitely be back to run those 26.2 miles again. There’s something very very special about them indeed. This just gave me SOOOO Much hope!!! 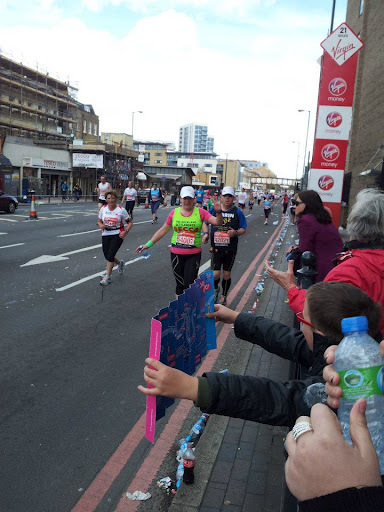 How exciting that you’re running in 2015 – such an amazing experience. I loved it.